This healthy and colorful recipe will please everyone at dinnertime - even the kids. 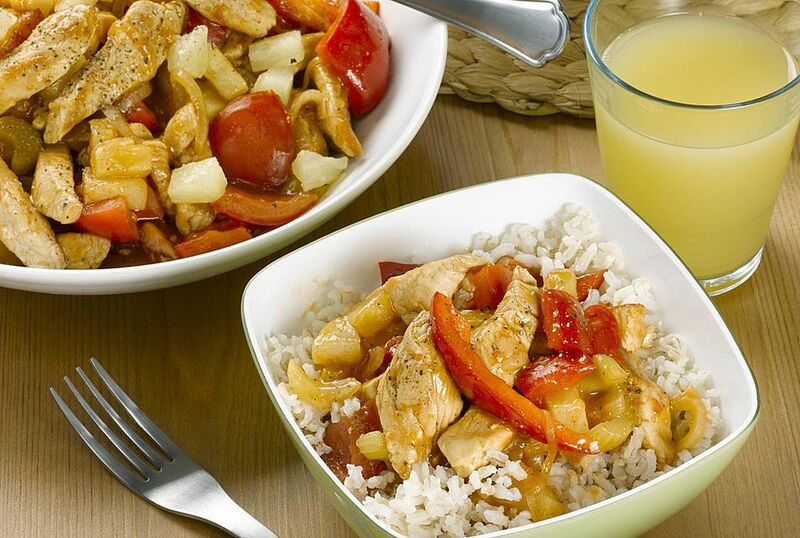 Slices of chicken (or pork) are cooked in a special Thai-style sweet and sour sauce that's tangy-delicious. Add shiitake mushrooms and bok choy, plus fresh vegetables such as bell peppers and tomatoes plus fresh coriander, and you've got a low-fat, one-dish meal that also makes a great party or potluck dish. First, mix the soy sauce with the cornstarch - this is your marinade. Mix with the chicken and allow to sit while you prepare the sauce and vegetables. Add all other sauce ingredients to the bowl except the cornstarch. Stir well. Now prepare all your vegetables for stir-frying. Place 2 tablespoons oil in a wok or large frying pan over medium to high heat. Add the chicken or pork (together with its marinade). Stir-fry 1 to 2 minutes, or until meat is firm (You may need to add 1 or 2 tablespoons water to the wok/pan whenever it turns dry). Add the sauce (with the lemongrass), stirring well. Bring to a boil, then lower to medium heat. Cover, simmering for 5 minutes. Add the mushrooms, green onion, and bell peppers, stirring well. Continue cooking another 5 to 6 minutes, or until vegetables have softened. Finally, add the bok choy or Chinese cabbage, stirring it in. Cook another 1 to 2 minutes, or until the boy choy or cabbage is tender. Add the arrowroot/cornstarch (dissolved in water). Stir well. Turn down the heat to low. As the sauce in the dish thickens, do a taste test. If not salty enough, add a little more fish sauce. If too salty, add a squeeze of lime juice. If not spicy enough, add a little more chili. If not sweet enough, add a little more brown sugar. If too sweet, add a little more rice vinegar or some lime juice. Sprinkle with fresh coriander and serve immediately with plenty of Thai jasmine-scented rice. ENJOY! Leftovers: this dish makes for great leftovers. Keep covered in the refrigerator for up to 1 week, or freeze in a casserole dish and then pop in the oven when you need a quick dinner. For a breaded version of Sweet and Sour Chicken, see my Classic Thai Sweet & Sour Chicken Recipe.